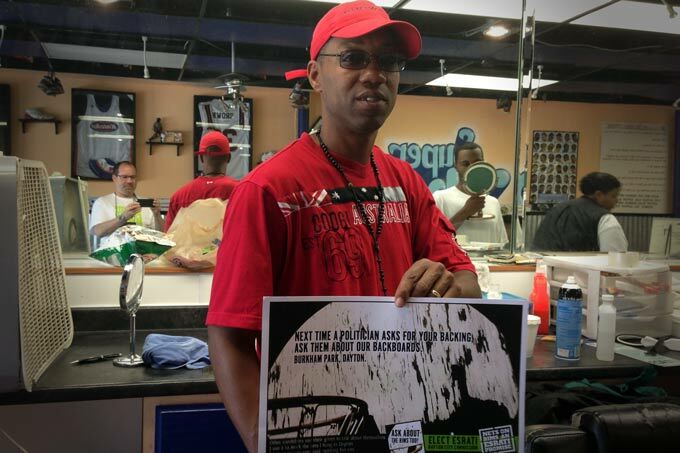 Dave Moore of Superfly Barber shop wants to know why our backboards aren’t cutting it? Superfly Barber Shop is on North Main, just North of the empty lot where the Troutman Recording studios were. The shop was hopping when I came in on Saturday afternoon, which is great to see, after that building had sat mostly empty except for Wei’s Pizza (the former Dayton’s Original Pizza Factory location). They are at 2018 Salem Avenue Dayton and the shops phone is 937-469-5347. Dave Moore sponsored a court- but, he too wants to know why the backboards at Burkham park look the way they do. And thanks to the tip to check on Highview Hills park- I spent a couple of hours cleaning glass off the courts, chipping the weeds out of the cracks and hanging 6 more nets.